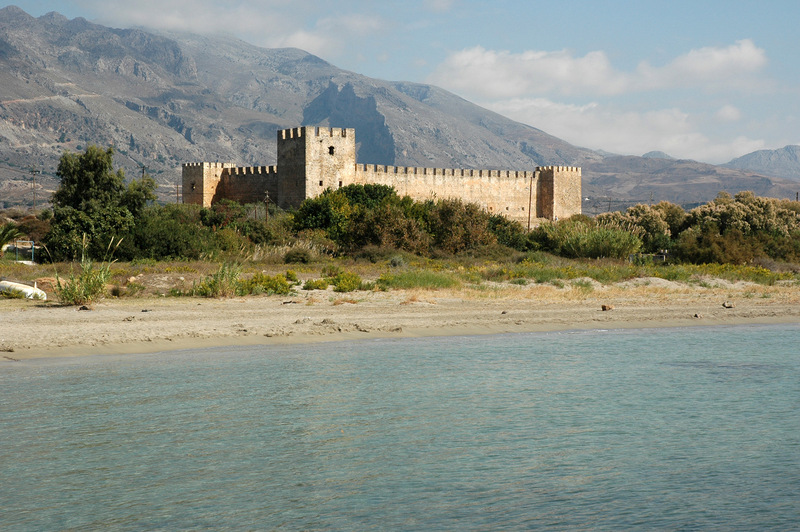 This 14th century Venetian castle, and the scattered hamlet of the same name, is 42 kilometers as the crow flies south and west from Chania. The distance is considerably longer than that by car or bus, especially since one has to cross the White Mountains to get to it. The castle is almost at the water's edge of the Libyan Sea (about 100 meters), and sits on a narrow coastal plain that rises precipitously into a thousand-meter peak of the White Mountains, only 5 kilometers inland from the sea. Considering the width of the beach it fronts (50 m), the castle was even closer to the water once. Frangokastello is about 12 km east of Chora Sfakion. 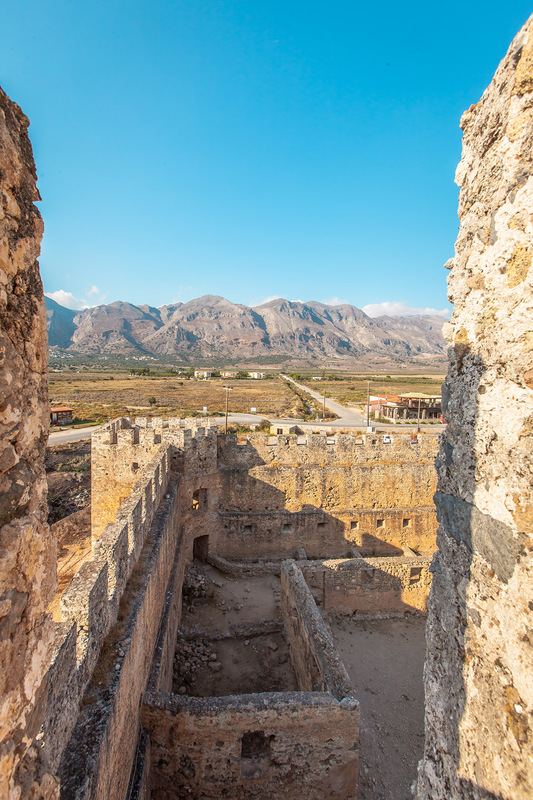 The Venetians built this rectangular structure with castellated towers at each corner to control the restless Cretans of the Sfakia region. Sfakia is one of the largest (470,000 sq. km) and least densely populated (pop. 2,000) regions in Crete, and was one of the few areas of Greece never fully subdued by foreign powers. It's people are known as fierce, tough fighters, and the landscape is harsh, although some decent agriculture gets done on the coastal plain. The Castle was also meant to defend the estates of rich Venetians, and to protect the region against pirates. 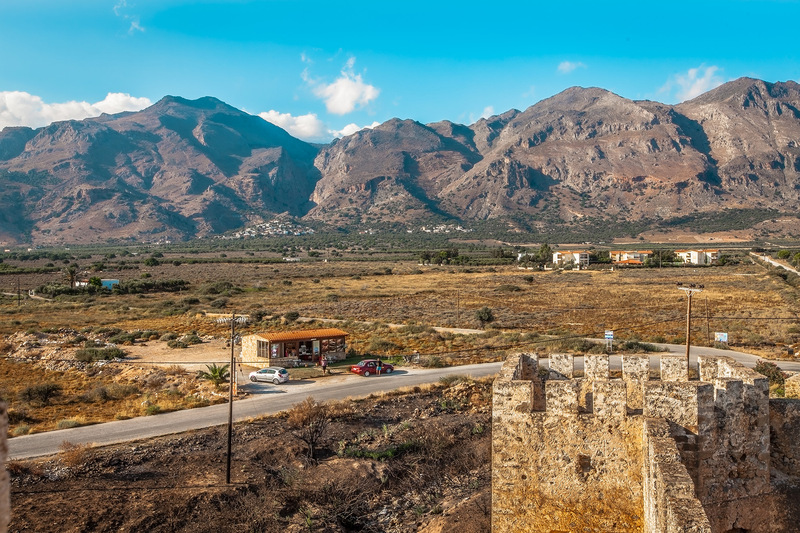 The road from Chania, after passing the village of Vryses, crosses the White Mountains on its way to Chora Skafon in some of the most dramatic landscapes in Crete. Sfakia has many deserted or nearly deserted beaches. Sfakia is gouged by many gorges between chains of mountains, most famous being Samaria Gorge. Chora Skafon was a focal point of resistance against both the Venetians, and the later Ottoman Turks. An interesting legend, and a phenomenon completely unexplained by modern scientists are the Drousolites ("dew shadows"). 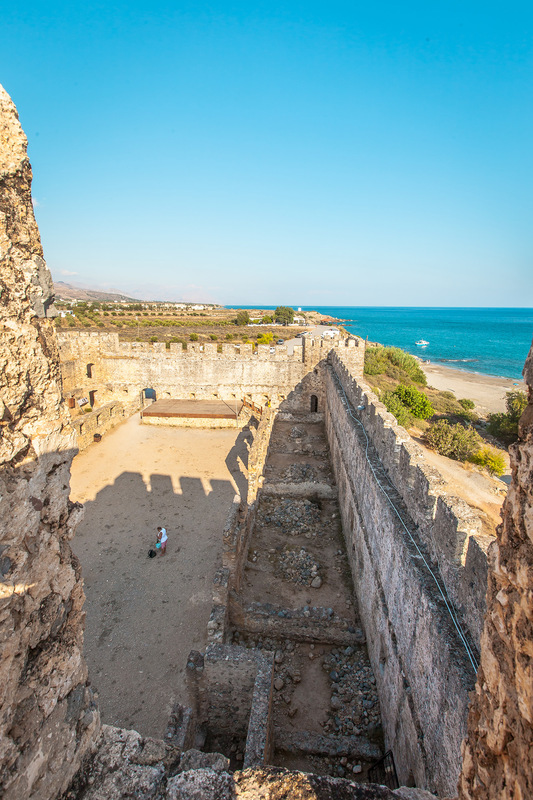 Witnesses over the years describe a group of dark-clothed shadows in human form in movement from the Monastery of Agios Charalambos some10 km west of the castle, along the coast toward the fortress. The story is that these were Greek warriors who died during the Battle of Frangokastello on May 18th, 1828, and reappear from time to time. The soldiers fought the Turks during the Greek War of Independence, and after a 7-day siege 350 of them lost their lives. The "Drousolites" name comes from their appearance in the early morning towards the end of May or the beginning of June, on days the sea is calm and there is moisture in the air, and before the sun gets too high. The apparition lasts around 10 minutes, and can be visible as far as 1000 meters distant. Some tried to explain it as a mirage of coastal Africa, 300 km away, but no satisfactory theory of the phenomenon has been arrived at. There are stories of a sortie of Turkish soldiers being frightened away by the apparitions in 1890, and of a German patrol opening fire on them during WWII. 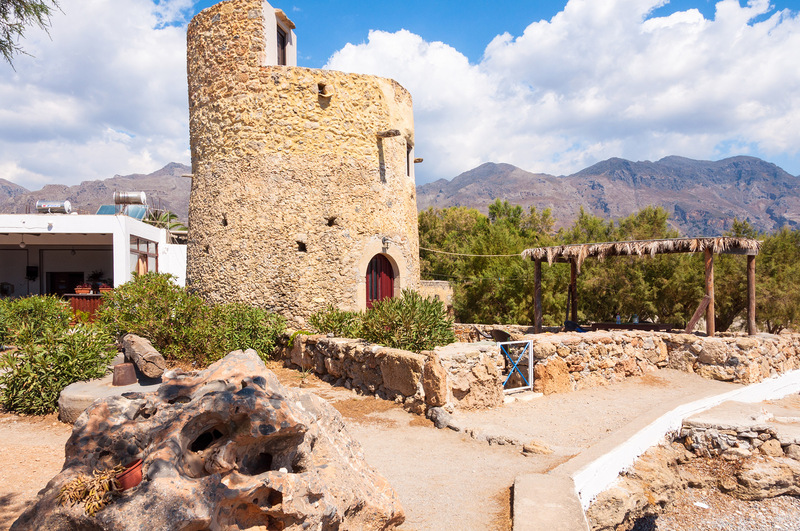 There are some places to stay in the area, including a hostel/hotel just to the landward side of the fortification, and a number of nice beaches, including directly in front of the castle. Another nice beach, one of Crete's prettiest, called "Ammos Orsi," is about 300 m east. The fort, the deserted landscape, and the abrupt rise of the White Mountains just to the north make for a wild and wonderful destination which by its very remoteness has discouraged major tourist development.